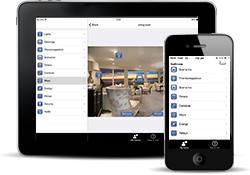 The “HA Mobile” App lets you monitor and manage the Bpt home automation system from your iPhone or iPad, locally via a wi-fi connection or remotely via the Internet. All this by navigating through the relevant menu or with the help of graphic maps that can be personalised appropriately by importing the pictures from the different rooms. Bpt’s HA Mobile, to make sure your home is always at your fingertips! Available in Italian, English and French.